This year, the Park Scholarships program proudly graduated the Class of 2017. From a pool of 1,642 applicants in the fall of 2012, the Park Selection Committee saw in these then-high school seniors their potential to excel as scholars, leaders, and in service to their communities. Indeed, the Park Class of 2017 has made a significant impact at NC State and elsewhere throughout the nation and world – from parks and natural spaces here in the Research Triangle, to the Belize National Zoo, to an archaeological excavation site in the ancient city of Petra. 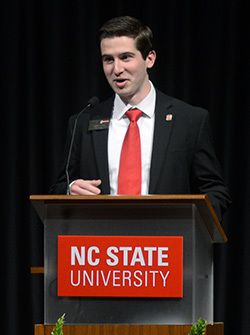 Members of the Class of 2017 upheld traditions and embodied NC State’s “Think and Do” spirit as campus leaders. Among them are a former student body treasurer, Student Senate president, and Union Activities Board president. One was named NC State’s 2015 Leader of the Pack and represented the U.S. on its two-time world championship cheerleading team. Three co-chaired Service Raleigh—one for two consecutive years—and two co-directed the annual Triangle Youth Leadership Conference. Under the leadership of this class’ four Krispy Kreme Challenge directors, the charity race committed $2 million to UNC Children’s Hospital by 2020, resulting in the hospital’s naming of its Raleigh-based clinic the “NC State Park Scholars Children’s Specialty Clinic” in their honor. 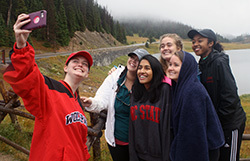 Beyond the borders of campus, scholars in this class cultivated meaningful volunteer relationships with nonprofits and local organizations, such as the American Red Cross and Urban Ministries of Wake County. Many served as role models and mentors to area youth through their own initiatives; for example, organizers of the Empowerment Project hosted workshops to build middle school girls’ confidence and leadership skills, founders of Musical Empowerment at NC State provided free musical instruments and lessons to children in underserved schools, and creators of Women Influencing Lives through Literature used texts as tools to promote young women’s pursuit of healthy, purposeful lives. As part of their Park Civic Engagement Initiatives, members of the Class of 2017 partnered with DKMS to host NC State’s first bone marrow donor registration drive—which yielded live-saving donor matches for five patients. Throughout their undergraduate careers, these scholars were passionate advocates for important causes ranging from gender equality to environmental sustainability. Among their ranks are Miss American Angus 2014 and recipients of the university’s 2015 Equity for Women Award and 2016 Green Brick Award. This class helped shine light on the issue of nonpartisan redistricting through its selection of UNC System President Emeritus Tom Ross as the recipient of the 2017 William C. Friday Award. And the scholars joined forces with several campus entities, raising funds to raise produce—on top of NC State’s Talley Student Union, no less—through their class legacy project to install an edible green roof. Over the past four years, many in this class were heavily involved in academic research and fieldwork—on campus and in locations ranging from Uganda and Guatemala, to the laboratories of the National Institutes of Health and the Pasteur Institute. The class’ two 2016 Goldwater Scholars, Chris Cooper and Vishwas Rao, went on to receive a Churchill Scholarship and a Fulbright Scholarship, respectively, and NC State lighted its belltower red in honor of each of them. Scholars in the Class of 2017 have applied their studies to practice by pursuing internships and co-ops with organizations such as ExxonMobil, the League of Conservation Voters, Cisco, and Red Hat. And one co-launched a startup company that won top honors (and seed funding) at the NC State Entrepreneurship Initiative’s 2017 Lulu eGames. Park Scholars in the Class of 2017 had the rare honor of meeting the Park Foundation’s Board of Trustees twice during their undergraduate career—first as freshmen when the Trustees came to announce the Park Foundation’s landmark $50 million commitment to help start an endowment for the program, and then during the fall of their senior year when the Trustees joined us in celebration of Park Scholarships’ 20th anniversary. As the program’s 18th cohort of graduates, the Class of 2017 brings the Park Alumni Society’s roster to about 840 members. We look forward to learning about these scholars’ future accomplishments, and maintaining their engagement with NC State and the Park Scholarships program throughout their lives. View photos from the Park Class of 2017 Senior Gala.